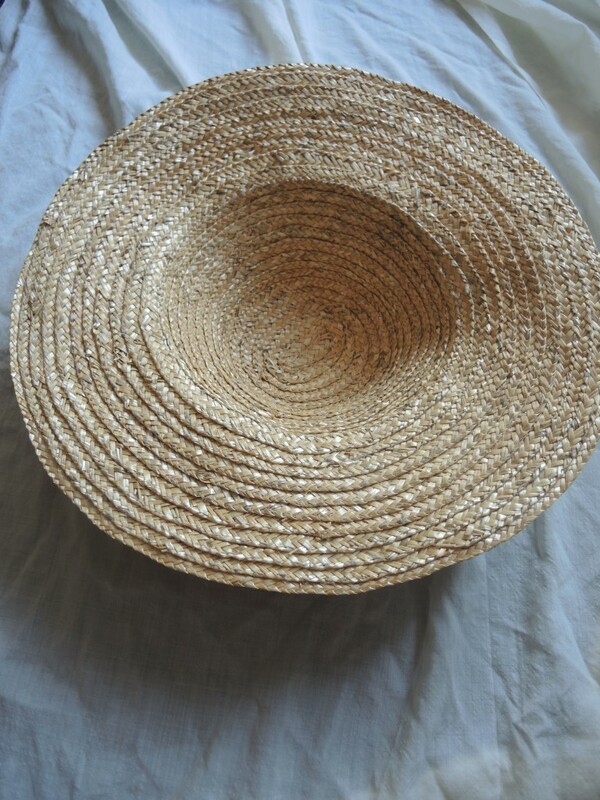 On the occasion of the “Straw hat month April, I have tried my skills at another project, a straw hat in the technique of the Lengberg finds. I had started it last August at our event at Bachritterburg Kanzach. Since I experimented with the technique for another impression of mine , I still had a lot of the material left. The original find is dated a bit later than our time of impression (1400s or early 15th century), the technique is similar to this model here from the late 15th century and it can be seen in many original pictures of our time. 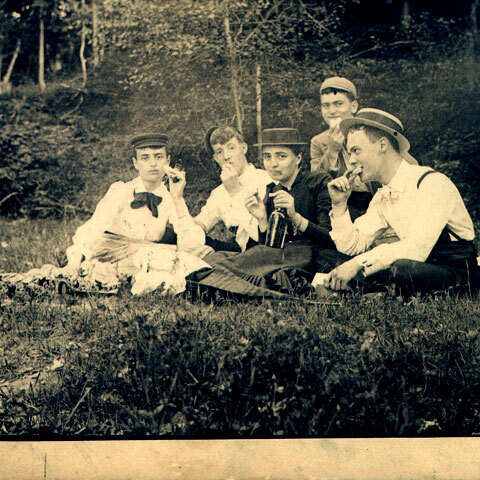 And there is another find from 15th-16th century Germany which I have gotten photos of from a friend. 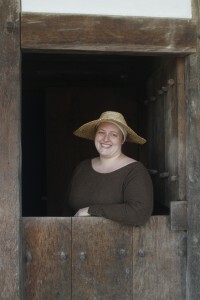 For the 14th century, there is a vast variety of different hat models to be seen in original pictures. First, this model I call the “Flowerpot” (Lilienfelder Chronik around 1349), a very popular form in the 13th and beginning of the 14th century different varieties of this form can be seen (Bozen, St Johann im Dorfe Kirche, Fresken around 1360). Here f.e. with a separate visor (Speculum Humanae Salvationis around 1350). This form is especially well known from the Maciejowski Bible. 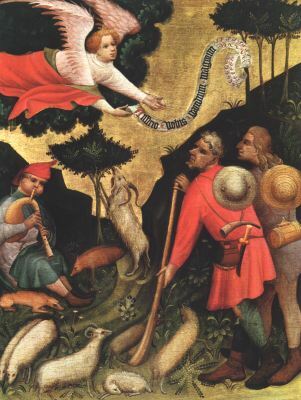 But also still popular in late 14th century (Einzug Christi in Jerusalem, um 1390 Carinthia). This Ufomodel here from Codex Manesse, which – I would think – is probably braided in one piece, can also be seen here (Meditations on the life of Our Lady (BNF It 115, fol. 8v), ca. 1330-1340) or here or here, while the last is almost a Flowerpot-Form again. An absolute classic from Luttrell Psalter, which is still popular today, a round cap and wide visor can also be seen Here (aus Hluboka nad Vlatavou, Tschechien/Böhmen um 1375). Especially likeable I find this Wannabe-Robin Hood Model from straw which can also be seen at the Frescoes of Runkelstein castle in Southtyrol where the technique of the straw braids can be well seen. Both are end of 14th century. A number of models, which makes me say that there is no ONE 14th century model of hats. Therefor I stuck to the original find. The technique is in use until today (although of course, today a sewing machine is used. The hat is made completele from braided straw, sewn into form. 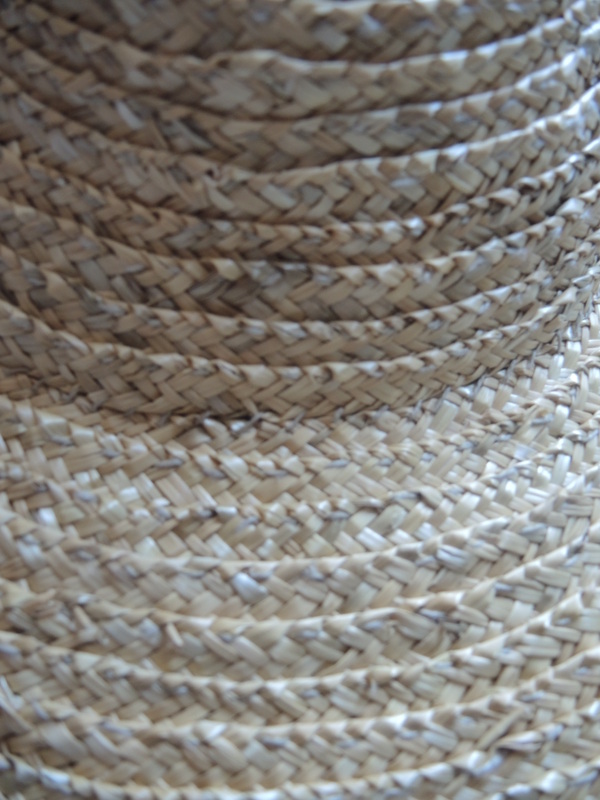 From baroque Bergere hats to antique Petasos’ to Regency bonnets, any form can be done. In this video here you can see how it is done. 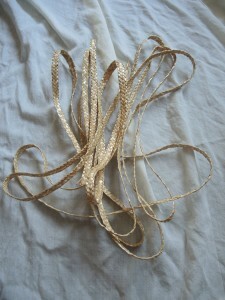 It is actually just braids laid over each other and sewn down as can be seen in a detail photo here. Forming the braids during sewing is not an art and only requires some threedimensional imagination and a bit of strength in your fingers. 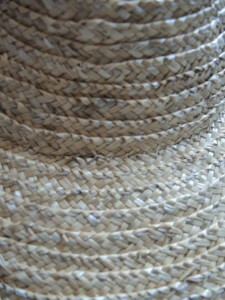 I would have loved to make the braids on my own, but it is easier to get by the ready made braids than by long straws. Luckily the ropemaker shop in Vienna sells 50 Meters of braids for app. 16 EUR which is enough for 3-4 hats. For sewing, I only use a bronze needle and strong linen yarn. 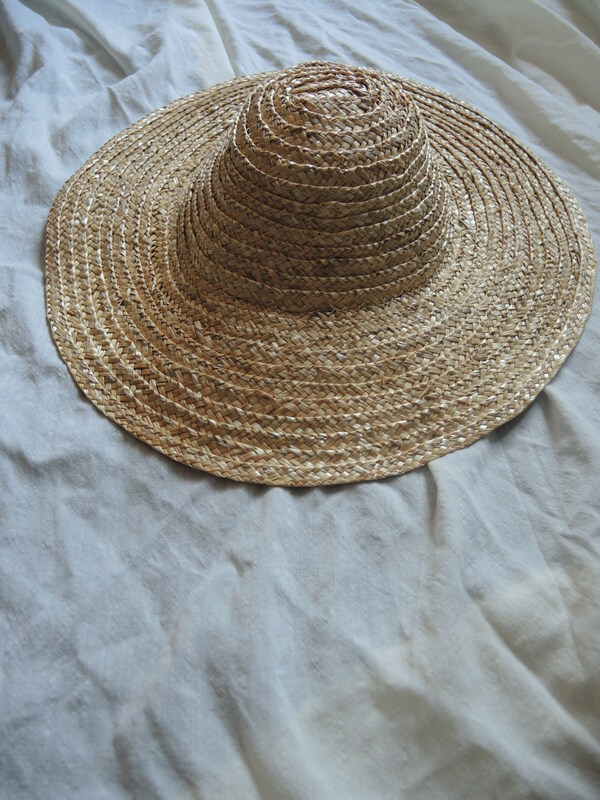 It is still a bit beded, but that can be easily corrected by wetting the hat and letting it dry in form again. 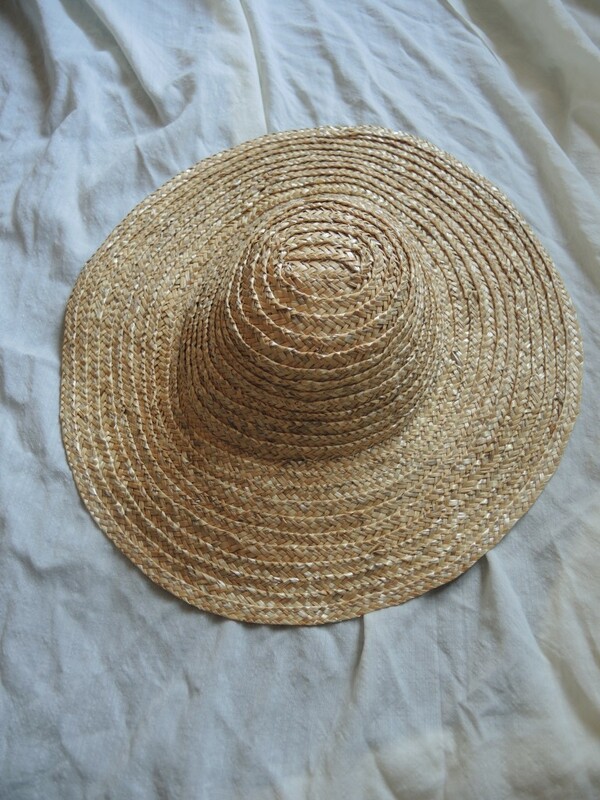 Straw hats are easy to maintain.